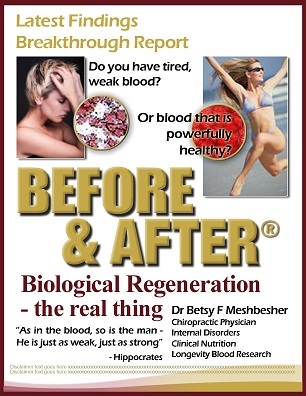 “When I first learned about Dr Betsy’s Bodymaker Program, I could see she was on the right path. I was familiar with natural health, cleanses and fasts which I started doing in my early 20’s. I was advised by this very wise and healthy 85 year old woman who said that if I kept my colon clear, I would have a healthy life. I very much took this as truth. 35 years later I have continued this belief. For 9 years I have used the Bodymaker Program from the beginning level to the advanced. The first time I did the Bodymaker Program I set out to do a 30 day cleanse. I felt so good and was getting such great results that I stayed on it for another 10 days. “Thank you for introducing me to The Bodymaker Program. Today, I’m twelve days into it and feeling great. The reason I’m writing is to share what happened in my first week. For the first two days I was off to a difficult start. I felt very fatigued and had a full time headache. I soon realized that I was in the grips of caffeine and sugar withdrawal. However, I knew it would pass and that I was getting that junk out of my body. So I hung in there. By the third day, my energy levels were coming up and the headache was gone. Since then, I’ve felt just a bit better and a whole lot brighter each day. On my seventh day I was scheduled to run a 5K race in Davis — the Davis Stampede. I’ve been running since last August and was wondering if my energy levels would be okay while I was cleansing. I made sure I got up early and got my Cleanse Solution and water down so that I would have plenty of time to eat my supplements a half hour before the race. I’m tickled to tell you that the Stampede was my best run ever! Everything was working great – – my energy, my breathing and my muscles were all just humming along like they should. This was the first time I’ve run when something didn’t ache or hurt or my breathing rhythm wasn’t off. I ran on auto-pilot. It was wonderful. Afterwards, I hit the free spring water, ignoring the junk food around me, and collected my t-shirt. And hunger wasn’t a problem either. I stayed on my regular schedule for the next cleanse and supplements meal. This is my third Bodymaker cleanse. I do it once a year around this time. I would recommend it to anyone. The first two years I used it to help me lose weight and lower my body fat – – which was successful. This year, at 112 pounds, I didn’t want to lose any weight and this has been no problem. I just make sure that I stay very hydrated and chew more at the cleanse meals. I’m working, lifting weights, running, playing and doing all the things I want to do while treating my body to the rest and nourishment it so richly deserves. Other benefits include: sinuses have cleared up, skin and hair look healthier, waking up more rested after a night’s sleep, and, overall, I just feel wonderful. Get started in our Bodymaker Programs Now…You deserve to be feeling great! Copyright © 2018 Meshbesher Health Corporation. All rights reserved.